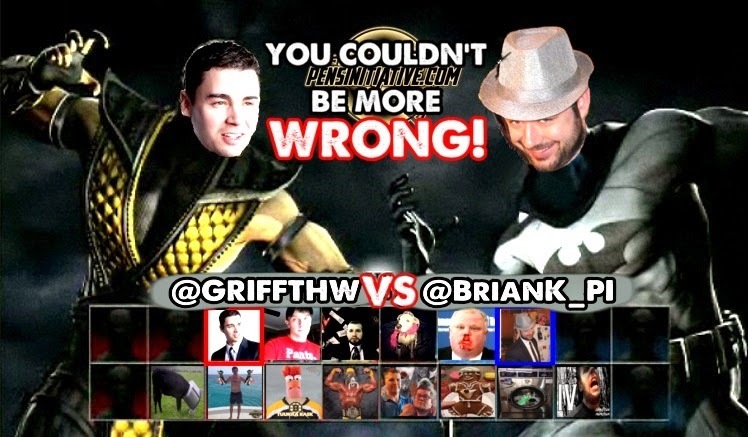 You Couldn't BE More Wrong is a new segment that Sean Griffin and I put together, naturally arising from the fact that we seem to frequently take the opposite sides of issues as they pertain to the Penguins. In case you missed last week's post, we debated Marc-Andre Fleury's future in Pittsburgh. SEAN: First off, let me just say I'm participating under protest if you're just going to arbitrarily declare a winner. I feel like, at minimum, there should be some sort of asterisk involved until this poll actually appears. Anyway, Jim Rutherford has a tough call ahead of him with regards to what he should do with Paul Martin. After all, the veteran defenseman may have missed significant time last year but, when he played, he logged more ice time (24:34 per game) than any other Pittsburgh blue liner. Serving as a mainstay on both the penalty kill (2:47 per game, second to only Brooks Orpik) and power play (2:59 per game, second only to Kris Letang), Martin provided the Penguins with a steady, two-way presence in all situations. Not only did he eat up tough minutes against opponents' best forwards, but he seemingly elevated the play of whomever he played alongside. Despite all that, though, the Penguins need to trade Martin at some point this year if the right opportunity arises. Will he prove difficult to replace? Absolutely. Will it hurt the blue line in the short-term? Probably. But dealing the impending free agent is all about asset management. Because, with the 33-year-old unlikely to return next year, the Penguins simply cannot allow another significant piece of their blue line to walk away without compensation. BRIAN: Well Sean, thank you for bringing up your thoughts on participating under protest and believing there should be an asterisk during our You Couldn't BE More Wrong segment. It's a very fitting time to do so. Leaving last week's victory in the past to focus on this week's topic, I think it's important to really break down how important Paul Martin is to this Pittsburgh Penguins team. I'll give a quick overview of the chart above for anyone who's unfamiliar. The x-axis is the offensive zone start percentage; the further to the right on the chart, the more a player starts in the offensive zone, and the more favorable of a position they start with on the ice. The further to the left, the more a player starts in the defensive zone, and the more difficult of a position they start with on the ice. The y-axis is the time on ice percentage of the competition. The idea is the more a player sees the ice, the better a player they are and the more difficult of competition that player is. The color of the bubble is that player's Fenwick percentage, with the colors based on the scale to the left. Fenwick is a measure of all attempted shots that take place on the ice, minus the shot attempts that are blocked, and the higher the Fenwick percentage the more that player's team was attempting those shots, indicating that team had possession of the puck more often. Finally, the bubble size corresponds to the goals for percentage, which is simply what percentage of the total goals scored when that player was on the ice were for his team. With that being said, the chart above is impressive. The pairing of Brooks Orpik and Paul Martin easily saw the most difficult assignments, facing the toughest competition while also receiving the lowest percentage of their starts in the offensive zone. Despite the disadvantage in zone starts while facing the other team's best, Martin managed to help flip the ice back in the Penguins' favor, posting a Fenwick percentage of 50.9% and a goals for percentage of 52.3%. Making his numbers even more impressive, Brooks Orpik has never been good possession-wise, especially the past couple seasons as his play has started to fall off, and Martin was still able to overcome his partner's lack of possession ability and prop him up. Hockey Analysis has some great With Or Without You breakdowns, and while they only show Corsi, not Fenwick, they do serve to tell just how impressive Paul Martin's play has been. The Orpik-Martin pairing has seen the ice together for 1027:09 out of Martin's 1303:33 5 on 5 TOI the past two seasons (78.8%) and has posted a 48.7% Corsi for percentage over that time. Without Orpik that number just to 53.4% for Martin, while it plummets to 42.9% for Orpik without Martin. You've mentioned the time on ice, and Martin is a guy who can eat huge chunks of minutes, compete at a high level at even strength, on the power play, and on the penalty kill, and is a great possession player. He's certainly the team's best defender, and it wouldn't surprise me if the plan is to use the Maatta-Martin pairing to do the heavy lifting while unleashing Letang-Ehrhoff to really pin the other team in their own zone. Freed from Orpik, Martin should be able to drive possession at an even higher rate while forming one half of a shutdown pair. Given how important he is to the team, how could the Penguins even think about dealing him before the deadline this year, even when considering that he is an upcoming UFA? SEAN: Um, because running a hockey club in such a shortsighted manner rarely leads to success. I'm not arguing that it will prove difficult to replace Martin. Hell, I'll even (begrudgingly) concede that you did a nice job outlining why he's such a valuable asset. But it's hard to imagine the veteran not cashing in next summer on what will likely be his last big NHL contract. It's even more difficult to envision that deal coming in Pittsburgh. That being the case, why wouldn't they trade him? Why would Rutherford risk losing another asset without receiving some form of compensation? In reality, the only reasonable answer would be that the loss of Martin would rob the Penguins of a legitimate shot at the Stanley Cup. Because "how important he is to the team" doesn't really matter if the squad comes up short in the postseason. But, with or without the defenseman, this team (as currently constructed) is still likely a winger or two away from posing a serious threat to capture the franchise's fourth Stanley Cup. So why not move a piece the Pens will likely lose anyway in an effort to address arguably the club's greatest need? As you outlined above, Martin brings a lot to the table, providing a coveted presence along the blue line. He represents what could be Rutherford's most valuable trade chip, one that could potentially fetch a top-six winger. In short, it's the most logical way to deal from a point of strength in order to bolster one of weakness. Yes, you're right; Paul Martin is incredibly valuable. He's so valuable, though, that there's no way the Penguins can let him walk away without getting something in return. BRIAN: I see that the two of us agree (GASP!) on what is likely to be Rutherford's point of emphasis at the trade deadline, and that's adding a top 6 winger. And on a very basic level, having a very valuable commodity in Paul Martin and trading him for an area of need (top six winger) makes a lot of sense. The problem though is that practically speaking it's going to be virtually impossible. With one year remaining on his contract, Paul Martin is going to be, for all intents and purposes, a rental player if/when Rutherford dangles him on the market. Being a rental, you're almost assuredly going to see contending teams being the only ones who would consider trading for Martin. It would make no sense for a team like Edmonton or Calgary to trade for him to have him on the roster for ~20 games, though Paul Martin's limited No Movement Clause likely makes that a moot point anyways. Now, the Penguins have a very specific area of need: a top six winger. Problem is, teams that are in the market for rental players are going to be looking to add players to their team, not trade them away. Contending teams could give the Penguins a package of futures, but for a team with legitimate aspirations of making it out of a weak Eastern Conference trading Paul Martin for picks and prospects would hurt the team's chances to compete. Not to mention, Jim Rutherford has said that he'll aggressively try to position the Pens to compete, so it's unlikely that he'd be interested in that either. So at the very least, a Paul Martin trade would require the Penguins to make a hockey trade with another contending team, and that in itself presents more issues. If the Penguins don't want to lose Martin and get nothing in return, a swap of expiring contracts isn't going to put the team in a much better situation, and the upcoming UFA market isn't very deep anyways. And it's unlikely to expect a contending team to put together a strong package consisting of a legitimate top 6 player signed beyond this season with no guarantees that Martin would be around past this year. There's a reason that rental players are usually traded from teams who are giving up on the season, and the packages for those players paid by contending teams usually consist of prospects and players not currently on their NHL roster. The weak teams get something for the players they were going to lose for nothing, and the strong teams add to their already strong rosters without sacrificing anything from the lineup they're currently icing. But for the type of package Rutherford is going to get back from trading Paul Martin, it makes much more sense to pass on any potential deals, look elsewhere for upgrades, try to make a deep playoff push, then trade Martin's rights for a conditional draft pick after the season. There will likely be enough interest then, and the team will still get something for him. SEAN: I get where you're coming from and it's a logical argument; getting at least something for Martin in the offseason is certainly better than watching him walk without compensation. But, like you said, the upcoming UFA market isn't very deep and, as a result, the Penguins may not have the luxury of finding a top-six winger in free agency. One reason this is such a tricky situation stems from the fact that the Pens' window won't be open forever. Thus, if you're going to move a player of Martin's caliber, you better maximize your return in the hope of setting yourself up for success before that window closes. But, if you move him for prospects or picks, you're gambling on a return that may or may not be able to contribute at the NHL level in the near future. That's why waiting till the offseason is a mistake. Because, just trading the blue liner as free agency approaches won't maximize anything. And that is exactly why, given the opportunity, Rutherford has to pull the trigger on a deal that makes sense this season. Obviously, a lot depends on the market but moving Martin prior to the deadline presents the best opportunity to maximize the Penguins' return. You outline a fairly black and white recipe for the way this type of trade goes down during the year but there's a lot of gray that exists outside that mold. Nobody is suggesting it will necessarily prove easy to find the right deal. But opportunities arise; circumstances change. Maybe Rutherford constructs some sort of package that suits a potential partner's needs. Maybe an injury forces a suitor's hand into something they wouldn't otherwise consider. Is it a guarantee? Of course, not. But the point is it's feasible. And, if the opportunity arises, Rutherford needs to take advantage of it. BRIAN: Sean, this isn't a situation where it's black and white and a million shades of gray. Sometimes when things seem overly-simplified it's because they're just that simple. It's going to be a contending team who would trade for Paul Martin before the deadline. That is a fact, plain and simple. For a return that's going to benefit the Penguins this season, teams trying to get better at the deadline are going to have difficulty meeting the Penguins' asking price. That is also a fact. You talk about the window for competing being open for a limited time, yet you're talking about hurting the team's chances to compete this season. If the team needs to win now, they need to try to win now. If they need to set themselves up better for the future, that's a different thing. 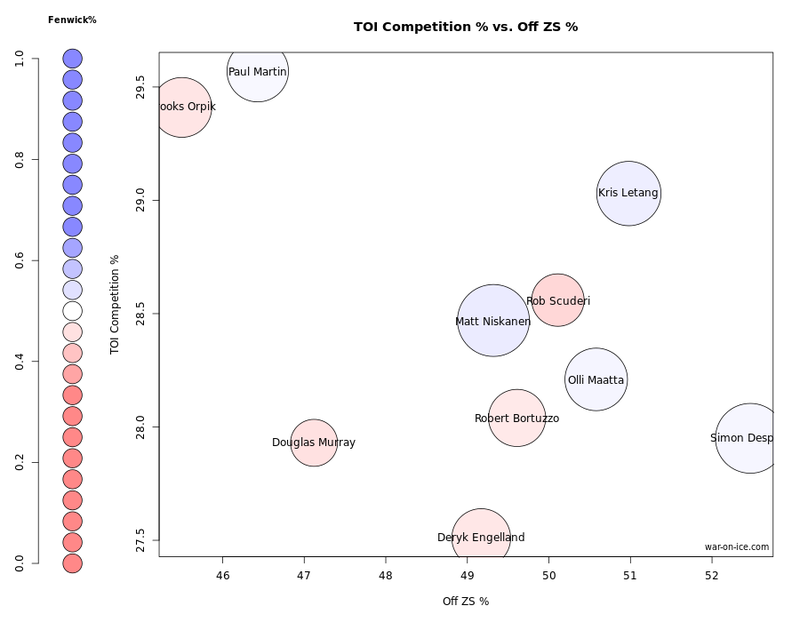 Also, Paul Martin is far from the only option from upgrading the top 6 this season. The Penguins have a deep prospect pool of defensemen, but let's break down exactly what they have in the organization. Kris Letang (1) isn't going anywhere, and NHL insiders like Elliotte Friedman think that Christian Ehrhoff (2) will re-sign with Pittsburgh not long after he's eligible starting with the new year. At the very least, Jim Rutherford will have a much better understanding of where he stands with Ehrhoff well before the trade deadline. Robert Bortuzzo (3) will be a restricted free agent and should be easy enough to retain as a 6th/7th defenseman. Barring a team being interested in acquiring Rob Scuderi (4), the veteran blue liner should be with the team next season. Olli Maatta (5) and Simon Despres (6) are young defenders who will be earning time with the NHL team this season, and the team has NHL-ready or near-ready prospects in Scott Harrington (7), Brian Dumoulin (8), Philip Samuelsson (9), and Derrick Pouliot (10) slated to play in Wilkes-Barre/Scranton. That's TEN defensemen who could have a legitimate chance at making the NHL roster next season, and even with a bit more attrition among those numbers that's still too many for the team to take. If the team needs to do anything, they need to utilize the wealth of young defensive prospects that they have. I know the idea of trading for Evander Kane is cliche among Pens fans, but let's use him just as an example. Evander Kane is 23 years old, and a player the Winnipeg Jets have been rumored to be interested in moving for seemingly forever now. He's a former goal scorer who has put up 99 goals and 101 assists in 324 career games. He's a guy that would look great on either Crosby or Malkin's wing, and if we can use our defensive depth to get him to Pittsburgh it would be well worth it. That would allow us to improve our top six, keep Paul Martin for a Stanley Cup push, and not have to worry about losing players like Samuelsson, Dumoulin, or Harrington on waivers if there's a backlog in the system next season. If we're looking for a rental player, the best rental will easily be Paul Martin. If we're looking to add forward talent to the top of the lineup for seasons to come, easily the best option for that is trading a young defender. Either way, Paul Martin is not a guy the team should consider trading before the deadline. Like you said, the window with Crosby and Malkin won't be open forever, and the Pens need to do what they can to capitalize now.